“Tolo, tolo, tolo ferenji” yelled the local kids as I ran by: “hurry, hurry, hurry foreigner” is what they were saying and, trust me, I was trying my bloody best. However, after 20 gruelling kilometres, I was struggling like never to finish the last kilometre in one sweaty dusty piece. 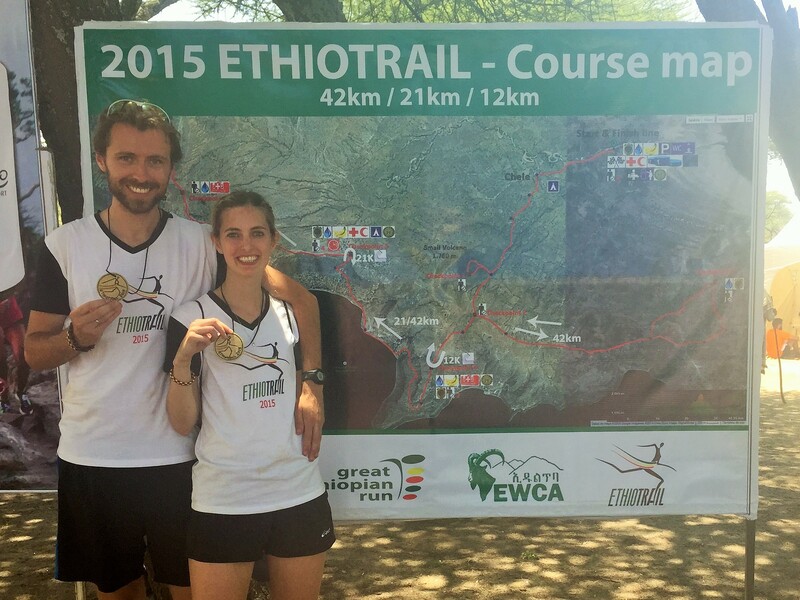 The Ethiotrail Half Marathon is a run like no other: part torture, part dream, the high altitude and the views are equally breath-taking. 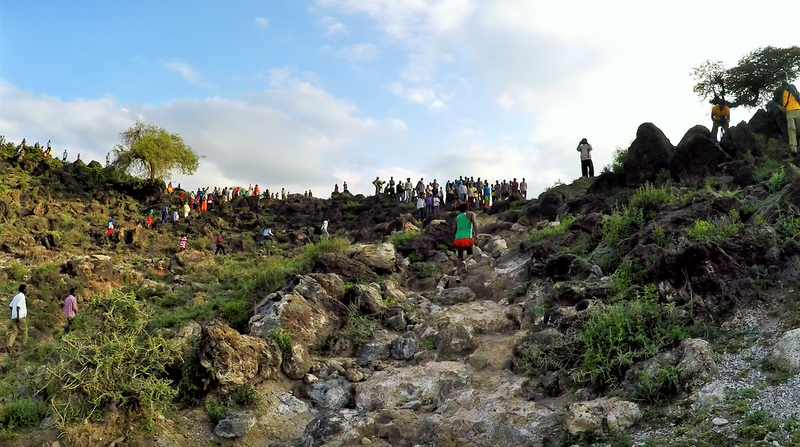 In its second year, it takes place in the Abijatta-Shalla Lakes National Park in south western Ethiopia. 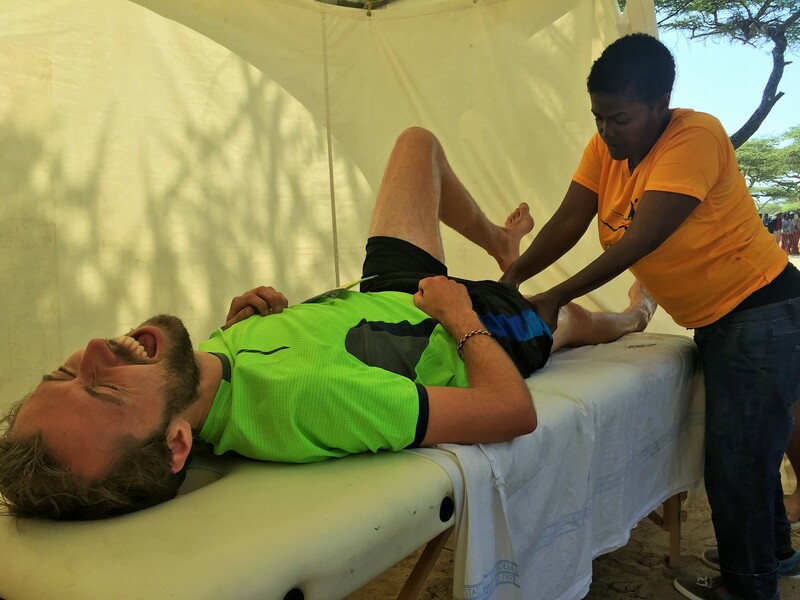 It is one of the best organised races I’ve taken part in which, considering its remoteness, is pretty incredible and is a true testament to the hard work and experience of the race organisers. The race course is utterly bonkers. Part dust track, part beaches, part volcanoes, part, erm, sheer cliffs, it snakes through villages which, without trying to sound too colonialist, really are as under-developed (by western standards) as it gets: mud/straw houses, hand-to-mouth agriculture, no electricity and, according to race organisers, a high likelihood that some of the children have rarely seen cars, let alone foreigners come by to run through their land. The race also has a positive social impact: 20% of the entry fees go towards the local communities and conservation and it helps promote the local economy by taking place. For example, the medal (which is probably the coolest one I have) is made by local artisans out of local volcanic rock. Anyway, back to race day. 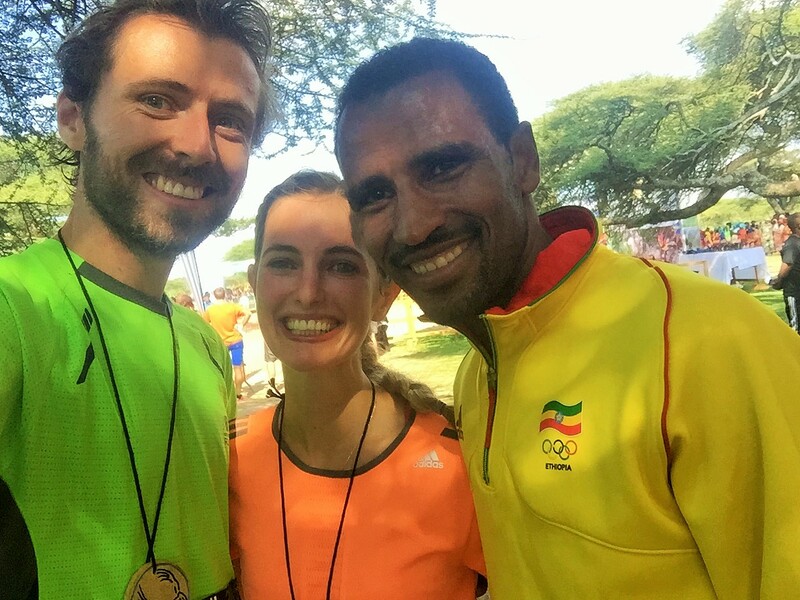 Like most African races, one of the make-or-break deals for the race to take place was to get it underway as early as possible to avoid the mid-day equatorial heat. With my alarm beeping like crazy at 4am, I rolled out of bed both cursing the early start but was grateful that, all being well, I’d be done and dusted by 8.30am. By 5am, we were on our way to the starting line with a one hour bus ride along the park’s tracks or, as locals call it, an “African massage”, such was the amount of shaking/rocking/bouncing. Just as the sun crept up above the horizon around 6am, we emerged from basically the middle of nowhere to find a full scale racing event with loud music, a party atmosphere, start/finish lines, timing chips, medical centre, massage tents, sponsors, stages, VIP tents etc The place was already buzzing with a huge crowd, some of which had walked 3 hours to be there for the start! To put it simply: wow! A few stretches later and off went the gun. At the front of the group were 50 or so elite Ethiopian runners, gunning for victory, pride and prize money. Amongst them and standing a foot taller in a lime green tshirt, sunglasses scratched to the point of blindness and carrying a litre and a half of water on my back was me, looking totally inconspicuous. The first race surprise was after only 5 seconds and 50 metres: one of the marker tapes which was keeping the start area clear hadn’t been removed, which added some unexpected steeplechase-ness to the race! This, however, was the only blip in the whole race – even the most remote markers which had been nicked by kids from the trees overnight had been replaced one-by-one by race director Jordi at 4 o’clock that morning to ensure it ran smoothly. 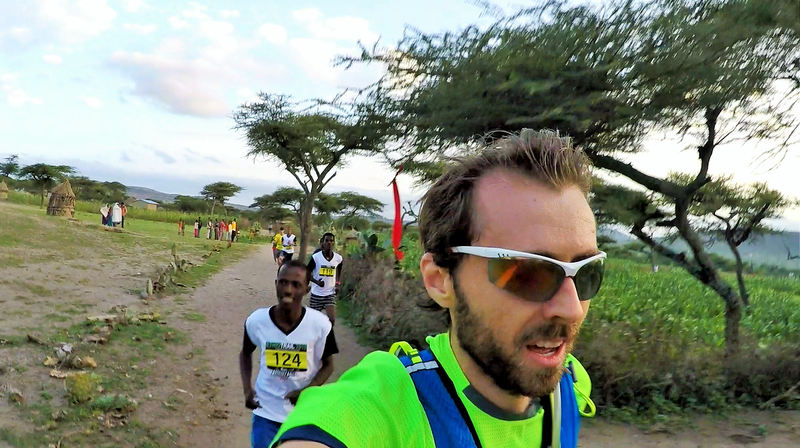 After 250m, I decided that a 3.45min/km pace at altitude (1,700m), on a sandy path, going uphill, all the while chasing down elite marathon runners was possibly somewhat suicidal. To be honest, even if I hadn’t consciously decided to slow down, my lungs were pretty clearly starting to push back against the low oxygen levels and an imminent deceleration was on the cards anyway! The course was relatively straight forward for the first few kilometres, despite its deceptive incline. The start was a mixture of sandy roads and (dry) river beds and was exceptionally well marked out, with a marker dangling from the trees every 50 metres. The river beds were mostly made up of rocky boulders and there was a large crevasse running down half the path but, overall, this was still nothing compared to what was to come. After 4km, we took a sharp right and suddenly, on the other side of a field filled with spiky acacia shrubs and small boulders, stood the “small” volcano we’d have to climb (or crawl). The “large” volcano, three times its size, was later in the race for the full marathon runners, a majority of whom had flown over from Spain – thank god I didn’t have the cojones to run the full race. Somewhat unsurprisingly, this climb was where all the elite female runners overtook me and I started walking for the first time. Had I not, I’d have burnt out within minutes. At the top, the view was stunning as the sun rose over the savannah and, just for a split second, you felt relieved as you thought you’d finished the hardest part of the race (you were wrong). While the climb was steep (10% incline? ), the descent was just utterly mental, with an almost 30 degree incline! You could run straight down if you wanted to but you’d be replacing your front teeth with pebbles if so. Some held hands. Some went backwards, facing the volcano. Some slid down on their bums – I didn’t, fearing the acacia’s 5cm needles. Like most, I just zigzag-walked down. The course was apparently changed at the last minute because the previous one was too dangerous – I guess it involved some sort of bungee jumping, Judas cradles and other medieval torture devices. The next few kilometres were slightly easier with fewer eyeball popping needles and cliff faces. Talking of which, we hit our first cliff face around then – as it goes, it was actually the more moderate of sheer descents and we cautiously made our way down to the lake’s beach, where flamingos awaited us 200m lower down. By this point, I’d long been overtaken by a few of the non-elite runners and I’d given up on any hope of finishing in either a decent time or impressive position. For the only time in the course, the markings became a bit sparse around here – however, as the jist of this section’s course was to “run along the beach until you reach the cliff at the other side”, it didn’t matter too much. Down by the beach, the majority of the course went through what I called the ‘field of broken ankles’: long grass, thousands of randomly sized and randomly distributed cobbles, it required the best tip-toeing at speed which I’ve ever done to get through unscathed. And, good news, it only got harder next! The final climb/cliff was the worst of all with a 150m climb in the space of 500 or so metres (that’s a lot!). Glutes were sore, quads were burning, calves were screaming as I clambered towards the top. However, as a reward for getting there, we were greeted at Checkpoint 5 – the turning point, by hundreds of locals who were cheering away. Being in the middle of absolute nothingness, this really was surreal. One gulp of water later and I was heading back down towards the beach, narrowly avoiding the cows which had decided to stand in the middle of the path. As I reached the bottom of the cliff, the first marathon runners (who had to complete a wider loop before reaching Lake Shalla), glided past me in the other direction, pretty much flying over any obstacle. Aside from the biological “how do they do this”? and the metaphysical “how are they doing this?! ?”, my main question was the physical “how on earth can they do this without breaking bones?”. I had to use my hands and knees to get up some parts and I’m about 40cm taller than some of them! Soon after, I ran past the first of the non-elite marathon runners. I could hear the distinctive thud of their heart as it sunk when I told them that “nope, it only gets worse!” I also ran past a few people who, in line with my side-splitting wittiness, had indeed sprained their ankles in the “field of broken ankles” (and dreams). The rest of the course was exactly the same as on the way out, except in the opposite direction. 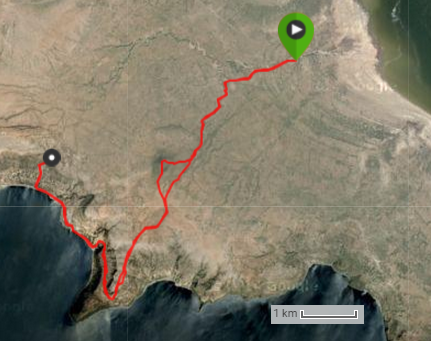 I had anticipated that this would mean that the last 3 kilometres, with their slight decline, would be the easiest. Nope. By that point, the sun was out, the temperature was up and I was absolutely knackered. I very rarely have to walk (unless it’s one of those crazy cliffs) but I found myself taking a break every kilometre here to recharge and drink. I was utterly spent of all energy. Finally, the crowds started thickening which signalled that the finish line was close. I sped up and, after 2h06, I crossed the line as 10th non-elite runner in front of thousands of local adults and children (and ahead of two of the elite runners!). In the 12km race, Pippa finished in 8th non-elite female – a pretty decent feat considering she broke her ankle 3 weeks earlier! 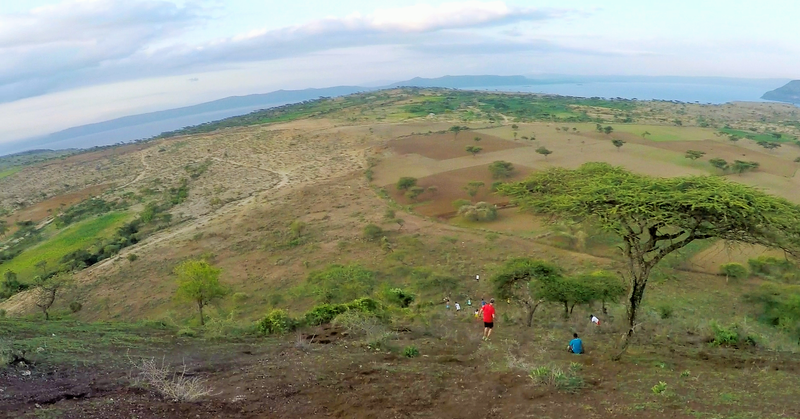 Most runners concluded that this was the hardest course they’d ever run – I agreed. On average, everyone took 50% more time than for a ‘normal’ race to complete it! However, no one entered this for PBs: you always knew it’d be a challenge. Even though we were all shattered, everyone was in a distinct party atmosphere at the end. Even Pippa and I (against my own will) got dragged into dancing to local music to celebrate. 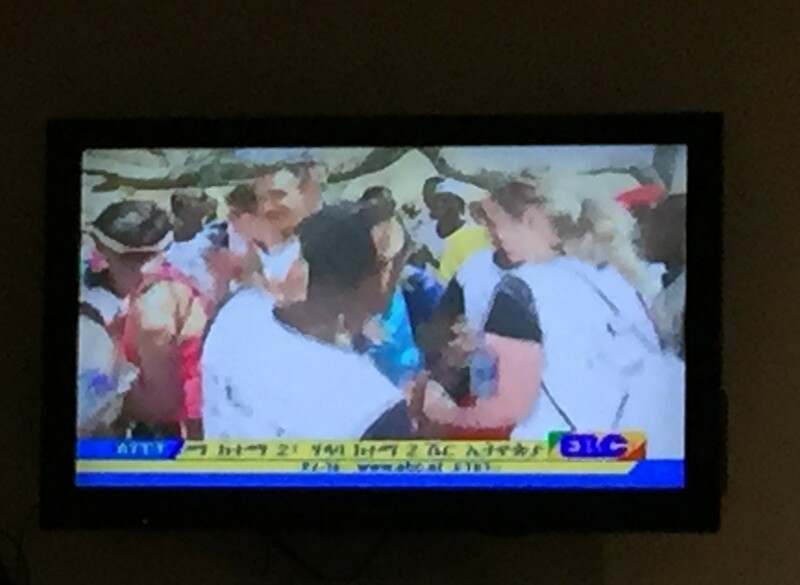 As we’d find out the next day while training at the high altitude Yaya Village training camp, Pippa’s moves even made it onto national Ethiopian TV! Mine didn’t. What a race and what a day. Definitely one to add to your bucket list if you’re up for something different, a bit of high altitude running, some amazing scenery in a safe environment, new friendships and a lot of laughter (and no PB)!